Traditional sanitation procedures typically do not include air handling units or their accompanying ductwork. Chlorine dioxide gas is the only residue free fumigation method that can successfully decontaminate ductwork and HVAC systems, including HEPA housings. Being a dry process and a true gas at room temperatures, CD is able to navigate the bends and turns of the ductwork system without condensing and getting "stuck." Typically, ductwork is decontaminated along with the rooms that it handles. On one occasion, there was only a need to use chlorine dioxide gas to decontaminate the ductwork itself. The exhaust ductwork in the BSL-2 and BSL-3 research laboratory of a major pharmaceutical company needed to be replaced. 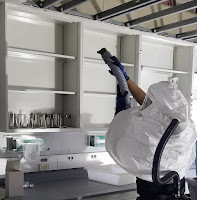 Since the ductwork was used to exhaust biological safety cabinets (BSCs) for testing on HIV and Hepatitis C, special precautions would be required prior to its renovation. The company decided that a fumigation style decontamination should be performed, and chlorine dioxide gas was chosen due to its ability to reach all surfaces and distribute throughout the entire length of ductwork without condensing or leaving a residue. The laboratory was located on the third floor of the building and consisted of a four-room BSL-2 area and a smaller, two-room BSL-3 area. There was a total of fourteen BSCs with exhaust ductwork that required decontamination and two ceiling exhausts. One chlorine dioxide gas generator was set up, and gas injection tubing was run to one BSC in the BSL-2 area and to one BSC in the BLS-3 area. The gas was then pulled through the exhaust system on the fifth floor and down to the distribution system and then into each BSC. A total of fifteen Bacillus atrophaeus biological indicators (BIs) were placed in each BSC and the two room exhaust vents to validate the decontamination. The results of the cycle yielded a greater than 720 ppm-hr decontamination time, which is more than adequate to provide a 6-log sporicidal reduction. All biological indicators were negative after the seven-day incubation period allowing the renovation crew to work in a safe environment without having to wear personal protective equipment (PPE). To read this case study in its entirety, click here.